Egypt’s Christians face backlash: Coptic churches are attacked as the violence among Egyptians widens. As Egypt erupts, the country’s Christians are being targeted and their churches reduced to rubble. Who is to blame? 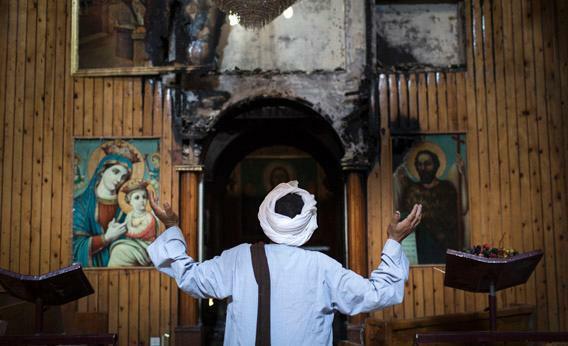 One of the Coptic churches of Millawi was set on fire and partially burned and looted by a small mob on Aug. 17. After an attack on a pro-Morsi sit-in, where more than 600 people died, Morsi supporters gathered after Friday prayers and stormed and burned two churches and some Christian-owned shops in Mallawi. MINYA, Egypt—“I left with only the black cassock that I’m wearing and my wife with her dress,” sighed Father Samuel Aziz Abdou. He was forced to flee his church and home as they were torched and looted by supporters of ousted President Mohammed Morsi on Aug. 14, according to Abdou, his family, and church members. Father Abdou has been head of the Anba Moussa Coptic Orthodox Church since 1995. This is the first time in its more than 80-year history that it has been attacked so violently, he said. All that remains now is the building’s charred skeleton, rubble, and gaping empty window frames. The church is located in the Upper Egyptian town of Minya, the capital of the governorate of the same name, about 150 miles south of Cairo. While 40 percent of Minya’s population is Christian, compared with roughly 10 percent nationwide, it is also an Islamist stronghold, and has produced many of the movement’s leaders over the years. Khalid Islambouli, a member of the Islamic Jihad movement that assassinated former Egyptian President Anwar Sadat, was born in Minya. The Gamaa Islamiya movement, which carried out an insurgency against the Egyptian government and occasionally targeted Christians during the 1990s, had one of its strongest footholds here. Down the street from Father Abdou’s church are two mosques, one affiliated with the Muslim Brotherhood, the other with the Gamaa Islamiya, locals said. Violence broke out across the country after six-week-old protest camps in support of ousted President Morsi were forcefully dispersed by Egypt’s police and army, killing hundreds. While the highest number of causalities was recorded in Cairo, where the sit-ins were largest, on the morning of Aug. 14, a pro-Morsi sit-in was also violently broken up in Minya’s Balas Square. Within minutes, Islamists were fighting security forces and rampaging through the streets, pillaging shops and museums and attacking churches. Christians say they are being blamed for supporting an Army-backed youth movement that resulted in Morsi’s ouster on July 3. “It as if they’re trying to send a message,” said Bishop General Anba Macarios, who heads a diocese of 80 churches in Minya and Abu Qurqas towns located in Minya Governorate. Father Abdou is elderly and walks with difficulty. The attackers stole $30,000 from his house, his wife’s gold, his passport, and all of the church’s possessions down to the toilet seats and air conditioning units. He is not alone. Many Coptic leaders have had to flee their parishes in the days following last week’s crackdown. In a Catholic church in the village of Mallawi, one hour away from Minya’s capital, Father Malak Girgis Ishaaq sought refuge with his Muslim neighbors when at least four masked men with beards entered his church and set fire to it with cans of petrol. A decapitated statue of the Virgin Mary is among the few items that remain standing. Muslims and Christians from the neighborhood, some armed with guns, eventually drove the attackers out, and put out the blaze. A church down the road was not so lucky. At noon on Aug. 17, embers still burned in the remains of Mallawi’s Evangelical Church, as young men from the local Christian community climbed over heaps of charcoal and rubble to brick up the entrances of the structure. They said the bricks were to ensure that no one filled the holy space with rubbish or turned it into a mosque, as they say happened in a nearby town. A young man in a brown galabeya with a large tattoo of a Coptic saint on his forearm, who declined to give his name for fear of reprisal, was in front of the church when the fire began. He said that because he didn’t stand out as a Christian—he’d covered his tattoo with his sleeve—he was able to observe the attack on the church. There was a march, he said, about 300-strong that came from a nearby mosque after Friday prayers on the “Day of Rage” on Aug. 16. The attackers were a group of Muslim Brotherhood members, Salafis, and thugs, many of whom had come from a nearby village, he said. When asked how he knew who they were, he said it was because they had beards. Other eyewitnesses said the mob included recognized members of the local community and thus their religious, ideological, and political affiliations are known. Witnesses said the attackers shot through the door of the Evangelical Church and used a gas canister to intensify the blaze. Before they ignited the church, however, parishioners say they burned a Bible and stole the sound system and many holy objects, which they then sold on the sidewalk outside the burning church. On Aug. 7, 16 human rights organizations issued a statement expressing their “grave concern” at the increasing sectarian violence and incitement to violence employed by the Muslim Brotherhood and its allies since June 30, when millions gathered in Egypt’s streets calling for Morsi’s ouster. Egypt has a history of violence against its Coptic population, and it’s getting worse, according to Ishak Ibrahim, a researcher at the Cairo-based Egyptian Initiative for Personal Rights. “In contemporary history, from the days of Mohamed Ali until now, this is the worst level of targeted violence against Copts and their properties that I know of,” he said. Ali is the founder of modern Egypt and ruled until 1848. At least 47 churches and monasteries have been burned, attacked, or looted, and seven Christians killed across the country since Aug. 14, Ibrahim said. Ten of the churches were in Minya. Here supporters of the ousted president, as well as common criminals taking advantage of the lawlessness, also attacked Copt-owned businesses, houses, banks, schools, pharmacies, and even an orphanage, as well as police stations, an Army-owned supermarket, and a Ministry of Education building. Two men, one Christian and one Muslim, died when a Christian-owned tourist boat, the Mermaid, was burned. “Christians in Egypt are always punished collectively, even if they had nothing to do with a particular incident,” Ibrahim said. While some Copts say they are thinking seriously about fleeing the country, some in Minya are defiant. “I can’t leave my country, ever. They want that,” said another young man who asked not to be identified. The military-backed interim government has condemned the post-Aug. 14 attacks, though neither the police nor the Army has come to their aid quickly, say Minya’s Christians and human rights groups. Father Abdou and other church leaders said they called the police for help when their churches were burning, but the police were unable to come to the scene as they were too busy fighting off Morsi supporters, who were attempting to storm police stations. The Army arrived in Minya on Aug. 16, when it was able to enforce a curfew that should have begun two days earlier. The lethal breakup of the sit-ins sparked serious sectarian violence in at least nine cities, according to Human Rights Watch. Ibrahim, of the Egyptian Initiative for Personal Rights, said security officials should have anticipated the backlash against Copts when they decided to break up the sit-ins. Members of the Muslim Brotherhood, however, deny that they are responsible for the church burnings. They contend that the state is perpetrating the attacks in an effort to discredit them. “Those who are doing this are the thugs of the Interior Ministry,” said Mohamed Abdel Azim, a former member of the Freedom and Justice Party in Minya, the political wing of the Muslim Brotherhood. “They are trying to create strife between Muslims and Christians so that the military has an excuse to kill people,” he said. Azim claims that where he lives, Muslims stood alongside Christians to protect them against thugs when a pro-Morsi march was passing through the town. “No one is saying that pro-Morsi people are attacking Christians except Christian extremists,” he said. With neither Morsi’s supporters nor security officials willing to back down, the outlook remains grim for many in Egypt, including its Christians.